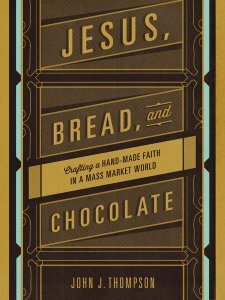 Jesus, Bread and Chocolate: Crafting a Handmade Faith in a Mass-Market World is like taking a deep breath. We live in a world that “values” cheap, quick, substandard and replaceable. Thompson’s book discusses various artisanal movements–small-batch coffee roasters, homemade bread, craft breweries, gardening, Americana music–and applies its principles to our faith, which in a lot of ways has become industrialized for a consumer mindset. Thompson offers a lot of observations from these various areas of handmade, small batch goods and how they could apply to faith. It’s a book that has come at the perfect time for our family. We started our first garden this year, and we are increasingly in search of products that oppose the cheaply made, convenient label. After I read the coffee chapter, my morning coffee tasted different, almost bitter. The observations he makes about cultivating a taste for the “real” stuff are life-changing beyond coffee, chocolate, bread and beer. If you crave something more meaningful in your faith, in your food, in your life, then get a copy of this book and let it stir something in your soul.